Everybody who is in need of equipment repairs or equipment replacement in the Iowa/Nebraska/Kansas areas or any others they may service that Central Nebraska Equipment is whom I would recommend. Brakes Plus has 71 locations total to date and have 8 locations in these areas. They have been a great joy to be associated with. To the great job they do with repairs to replacing new equipment as needed, we have been completely satisfied with the relationship. Todd and his crews have the knowledge and background to do anything we have thrown at them! They get it done on time or ahead of time and at a competitive cost! With being in charge of the equipment needs of 71 locations I have a number of vendors across the United States and these guys are at the top of my list! Wish I had Central Nebraska Equipment in all my regions, as good vendors are few and far between. These guys you want to do business with because they treat you like you’re their only customer! I like that kind of service, makes me feel special! I think that even if we only had 1 location Todd and his group would give exceptional customer service because of the type of people they are. Keep Up The Great Job! Thanks Todd and Stacey for being that special kind of vendor we all look for! We have been using Central Nebraska Equipment for about 15 years now. Todd and the guys have always provided prompt and accurate service. It’s always been nice to have them around for paint booth, air compressor, and lift installation, maintenance, and troubleshooting. We’ve tried some of the rest, but always stayed with the best! Thanks Todd and Central Nebraska Equipment! When we need service or maintenance with our shop equipment we call Central Ne Equipment. They have taken care of our needs in a prompt, friendly and professional manor. We simply cannot operate our business without our lifts and equipment and they understand that. We will continue to use Central Ne Equipment for our equipment needs in the future. Great service!!! 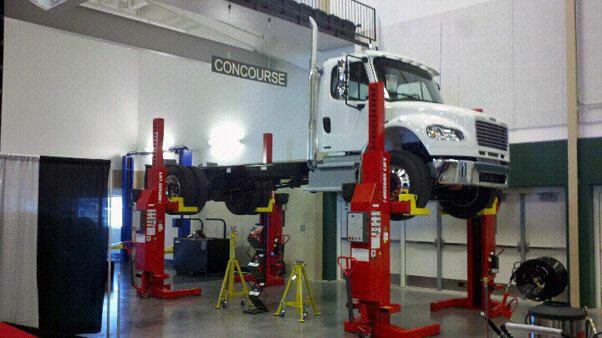 We have always used Central Nebraska Equipment, servicing our hoists. When we moved to the our new facility, Todd and his team suggested we use the new Shockwave hoists. We are pleased to say they work great, fast and efficiently.